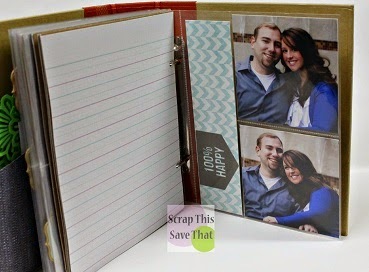 As I mentioned in my What's On Your Workdesk Wednesday post yesterday, I wanted to show you some pics of the Simple Stories Snap Book I made for my daughter and future son-in-law for their bridal shower a couple of weeks ago. It was my first foray into working with pocket pages, and even though I only made a few, I was super shocked by how quick they came together. Of course, that could also be attributed to my lack of experience in knowing what to do, and therefore, not doing enough! 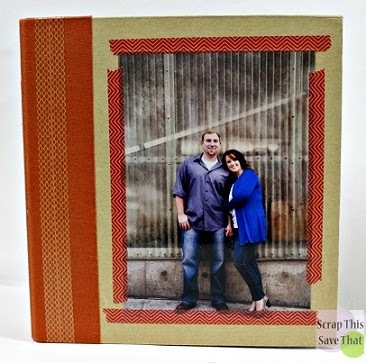 I put one of their engagement photos on the front cover but was worried about the corners or edges of the pic getting caught and tattered, so I added some Washi tape to the edges and all the corners. I lucked out by having just the right colors to go with the spine of the Snap Book! On the inside cover I added a pocket that is actually one from a Smash*Book collection. Emily put some of the food cards from her shower inside the pocket. On the first page is another one of their engagement photos. 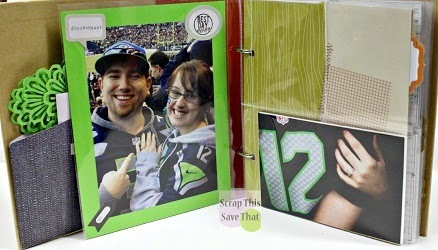 The opposite page has a sweet snapshot of them at a Seattle Seahawks game showing off her ring the day after they got engaged. The opposite page had some "his and hers" journaling cards that we took out before I shot the photos of the book...they were already written on and must have had some juicy personal stuff since I didn't even get to see them! Ha ha! The pages shown above is the reason that I gave it to her during her shower. I made 3x4 journaling cards (downloaded from Sweetly Scrapped) and sent them out with the shower invitations, asking each recipient to fill it out with their relationship advice for the bride and groom. I personalized each card for them before printing them out. My daughter is a VERY strong, independent woman. She works with others in a domestic violence agency for deaf women. You can read more about her work HERE and HERE.) She's all about surrounding herself with her "circle of strong women." In that spirit, when I gave her and her fiance the book at their shower, I read a card I had filled out for them with my bit of advice, and then we went around the room, and each woman there read her card, and then gave it to Emily to put in one of the pockets of their book. The idea was, that when the cards were all given, she would have the beginnings of a book of "words of wisdom" given to her by her strong circle of women. She has lots of empty pages left, so that she can also ask guests at their wedding to fill out other cards with well wishes on them. 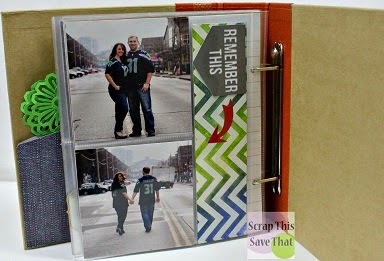 Eventually they will have a book filled with memories and words and love from their closest friends and relatives. Okay, I was pretty proud of myself for coming up with that idea! It's probably not totally original, but the presentation was something that I knew she would cherish! Okay...back to the book! 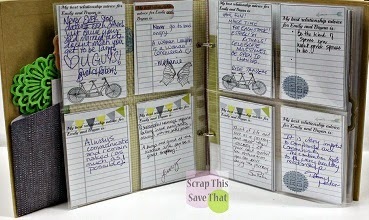 The Snap Books come with three dividers and a handful of pages, but I wanted them to have lots more than that, so I cut down lots of pages of patterned cardstock to give them more room to write and add their memories. My Crop-a-dile Big Bite punched holes that were the exact same size as the holes in the original pages, so that worked out perfectly! I folded some of the leftover scraps into more pockets like the one you see above. It's hard to tell, but she actually has her shower invitation tucked into the pocket for a keepsake. 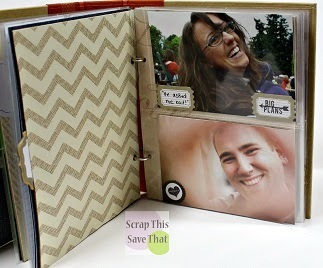 The photo above shows one of the dividers that came with the Snap Book. 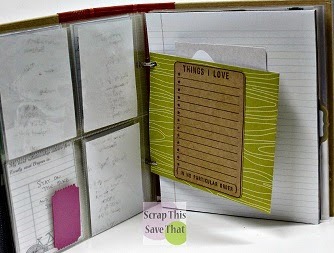 They were just plain kraft colored, so I added papers to them to jazz them up a little. 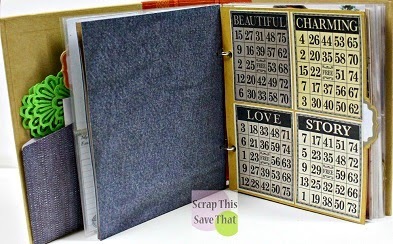 The one shown above had Bingo cards I cut from individual sheets of cardstock I got a long time ago when I went to Beth Kingston's (spokesperson from Xyron and HSN) garage sale. I cut the Bingo cards apart, put them in the order I wanted, and then Mod Podged them to the divider. The last few pics just show some of the photos I included in their book. The one of my daughter, above, is the same photo I used in my Washi tape layout a while back. The pic was the look on her face as soon as she heard a voice mail from a cute guy asking her out for the first time...and now, she's about to marry that cute guy! How awesome is it that we were able to capture that very moment in time? So I thought the addition of this photo in the book was mandatory! The last two pics have more photos from their engagement session. I cut two arrows, one for each page, on my Silhouette Cameo, using cut files I found in the Silhouette Store. I had so much fun making this book for my kids! Thanks for sticking with me while I was droning on in such a long post! Haha! Below, you'll find a list of supplies used. Oh, and by the way, if you have any words of wisdom or know of any awesome videos about pocket pages as I start my pocket journey, I would LOVE to know about them!!! Thanks in advance! Oh Amy this turned out beautiful. I love how well the washi tape worked together. And the cards is just the greatest idea. Love it!! !